On a night when International Soccer history was being made (at least as far as the Irish soccer team was concerned), and when it seemed the world and its mother was watching, it was gratifying to see so many turn up in the public library in Inchicore, Dublin, for the unveiling of a far greater history - the New, Improved and Enlarged Great Book of Kilmainham. The book had been launched in June, 2015 (see here) but this was the unveiling of the giant display version on Wednesday, October 7th. The book was unveiled by Margaret Hayes, Dublin City Librarian, who praised the work involved in putting the book together and the manner in which it is being displayed. 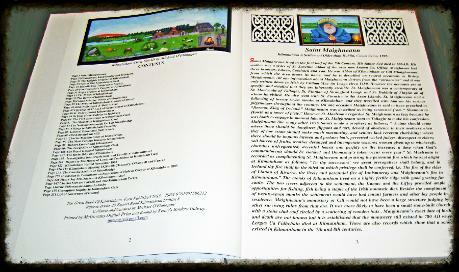 The display version of The Great Book of Kilmainham is A2 in size (i.e. c. eight times the size of a normal book), is illustrated in full colour and contains thirty eight articles outlining the history of Kilmainham by some of Ireland's most famous historians going back to the early eighteen hundreds. The Book is displayed on a very large lectern set on an ornamental cast iron base - necessary to support this great work. The cover of the Book is also highly ornamented, reflecting the style of some of the ancient hand-made books of Ireland. Speaking at the unveiling, Michael O'Flanagan, the curator of the Book and who's brainchild it is, spoke about the importance of books throughout the world from the earliest times ranging from the most famous Libraries in History such as the great Library of Alexandria which was burned down by Julius Caesar in 48 BC, to the work of Andrew Carnegie who built two thousand five hundred libraries throughout the world including some here in Ireland. In this digital age, with e-readers and videos, the printed word is often overlooked. Therefore, this reminder of the beauty and important content of books is timely and deserving of our support. The Book will be on display in the library for the foreseeable future and all are welcome to visit to view it. Public Transport: Bus: 51B, 68A, 78A. 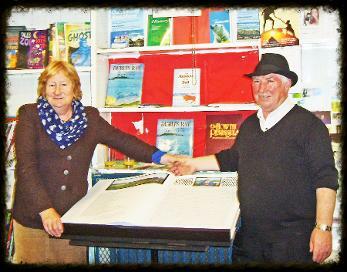 (below) The Great Book of Kilmainham which is now on display in the Inchicore Library, Emmet Road, Inchicore and (below, left) Michael O'Flanagan and his wife Helena with the Great Book.